Once in a while I read something which is so unusual, so bizarre that as my eyes scan the page, my jaw is literally open in that classic position of astonishment represented by the expression "jaw dropping". Although my intellect comprehends the information it is receiving, the emotional side of me cannot accept the veracity of the statements; it has to be a joke; somebody is pulling my leg. In my blog Anti-Abortionists: Murder by proxy I discuss the radical campaign of intimidation used by some pro-lifers of publicising contact information for doctors performing abortions. Even though what these doctors is doing is legal, these people are so dead against it, they have radicalised their protest by distributing "wanted posters" containing name, full address, car licence plates, descriptions of the person with pictures, work information and of course a list of their sins sometimes accompanied by images of dead foetuses. The point? There are apparently enough crazies out there who take it upon themselves to do the work of God by killing these abortion doctors. The wanted posters are a means of enlisting these crazies to do the Lord's work. Dr. George Tiller killed on May 31, 2009 by Scott Roeder. Dr. David Gunn killed on March 10, 1993 by Michael F. Griffen. Dr. Gunn had been the subject of a wanted poster campaign. In Canada, there have been apparently 4 attempted murders. Note that there is more information about clinics being bombed or set on fire; intimidating doctors and staff at clinics; hassling people going to the clinics; holding protests around clinics in order to disrupt their business, etc. This technique of intimidation, the wanted posters seems to have been used during the 1990's however according to a report by the MSNBC journalist Rachel Maddow, more wanted posters have turned up as of late. Who is behind this? While nobody knows for sure - the current batch of wanted posters are not signed - there is a name connected to this style of intimidation: Neal Horsley. This gentleman is best known for his web site The Nuremberg Files in which he publishes information about doctors performing abortions. He has gone so far as to strikeout those names that have been killed. He doesn't stop there though; he also publishes information about the women who are seeking abortions. He claims that he is seeking to shame them into not having an abortion. The question is whether he is also seeking to promote violence against them too. 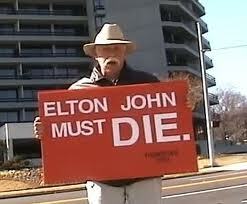 He is also against homosexuality. is running in 2010 for governor of Georgia (his web site) on a platform to secede from the rest of the United States so as to have a country which outlaws abortion and homosexuality. He has said he would kill his own son who is the U.S. military if his son was sent to stop him. Abortion is legal. The majority has spoken; let's move on. However, we're not moving on. Ring wing radical elements of the conservative end of the spectrum especially the religious fundamentalists believe they are right and the rest of us are wrong. They seek not compromise; they seek the imposition of their ideology on everyone. This is not democracy; this is imperialism. I would like to think that reasonableness will prevail. However it strikes me that a radicalised religious fundamentalist believes the attainment of their agenda is so important that the end justifies the means. Once you cross that line, you have opened the door to not respecting the law. Once you've gone that far, you are saying you would do anything to get your way. There are some truly scary people out there.